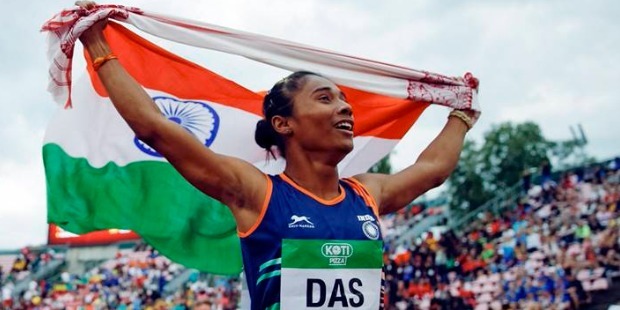 On the 12th of July 2018, at the IAAF World Under-20 Championships in Finland, Indian teenage sensation Hima Das was born as an Indian track legend. She became a legend in just 51.46s by winning the first-ever Gold Medal for India in the track events. 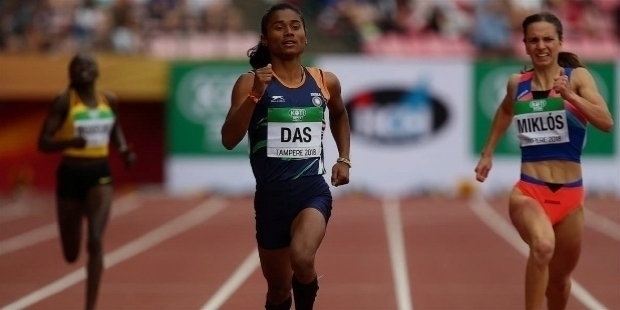 It is the sweetest moment for the 18-year young athlete, when Hima Das outrun other athletes with her amazing powerful burst to win the 400m final at Tampere, Finland. As the race favourite, Hima did not disappoint her fans, who were rooting for her. It was a race, which the athletics world will not forget so easily. Trailing at the 300m bend, Hima’s final kick from the 80m was simply outstanding! “I am very happy to win the gold in the World Junior championships. I want to thank all the Indians back home and also those, who were here cheering me. It was very encouraging to have this kind of support,” stated Hima Das ecstatically after the race. Hima Das became the first Indian track athlete to win the Gold medal in a prestigious IAAF World Under-20 Championships. The amazing factor of Hima’s magnificent achievement is that she entered the world of athletics just 18 months ago. Hima Das has put her small village Dhing, Nagaon district, Assam on the international map and global attention. Daughter of a rice farmer, Hima has not only created history for Indian athletics, but also she has displayed courage to dream big, work hard towards her goal and win hearts of the billion plus Indians. Hima entered the 400m final as the fastest qualifier. She was the hot favourite to win the event. The confidence and tension of the final shake even the bests of the best athletes of the world. 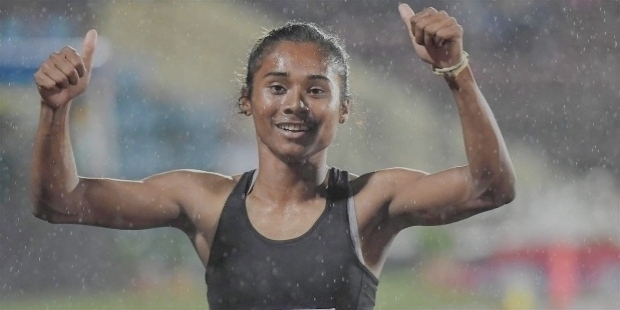 As the shot was fired, Hima ran a calculated race with her strong believe and Coach Nipon Das’s advice. She covered the 300m with great stride. At the final bend, Hima was behind American Taylor Manson and Romanian Andrea Miklos. With 80m to go, Hima changed gears like a pro to outrun both to clinch the first-ever Gold medal for India in 51.46s. While other athletes were gasping their breath, ecstatic Hima was acknowledging the crowd with her arms. She ran towards her Coach, who handed her India’s flag. The teenage sensation shared her win with Miklos and Manson in joy. Her amazing feat will be etched in golden letters forever in history of Indian athletics. 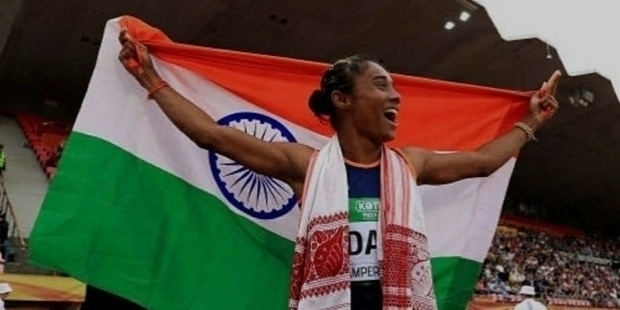 Hima Das became the first-ever Indian athlete, man or woman, to win a Gold medal in a track event in the international level. Hima Das was born at a small village Dhing, Nagaon district of Assam on the 9th of January 2000. Father Ronjit Das and Jomali are rice farmers. Hima is the youngest among the six siblings. A sports’ lover, Hima was enjoying her days playing football with boys in her small village. There was something special about Hima, which caught the eye of a local Coach, who advised her to take up athletics. At the inter-district athletics meet in Sivasagar, Assam, the Directorate of Sports and Youth Welfare athletics Coach Nipon Das was also present there. He spotted Hima winning the 100 and 200m race at the event. He was amazed by her talent and speed. Incidentally, it was Hima’s first competitive race as an athlete. Nipon Das asked Hima to move to Guwahati, 140 km from her village, to achieve bigger goals in life. The Coach had to convince her parents. They family was reluctant to send Hima so far away. Nipon insisted about her future in athletics. They finally agreed. Coach’s aim was to prepare Hima for the relay team for the Asian Games. She surprised even her Coach with her outstanding performance at the IAAF World Under-20 Championships in Finland. With immense potential, Hima has been bettering her own timing. Her personal best in 400m is 51.13s. 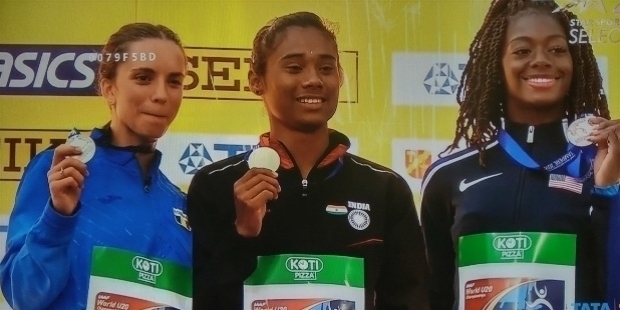 Winning the Gold medal, Hima Das joins the likes of Javelin Gold medalist Neeraj Chopra, Discus Bronze medalists Seema Punia and Navjeet Kaur Dhillon, who have all won medals at the World Under-20 Championships. Hima represented India at the 2018 Commonwealth Games in Gold Coast, Australia in April 2018. In the 400m final, Hima clocked 51.32s to finish sixth in the race. 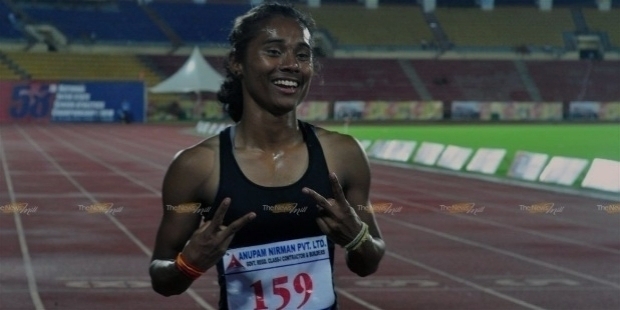 Her timing of 51.32s was Indian Under-20 record. 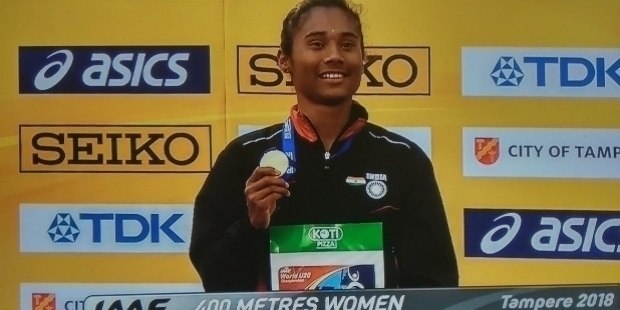 At the National Inter-State Championships in Guwahati, Hima bettered her own timing clocking 51.13s, while lowering the Indian Under-20 record in 400m.